Editor’s Note: We love hot rod woodies at Monterey Car Week, and there’s nothing better than a woody with a Ford in a Ford. At the Dingman Collection Sale 2012, RM Auctions sold a wonderful 1939 Ford Deluxe Station Wagon for a great deal of green. Thanks to RM for allowing RR to publish these exceptional studio photos and the detailed article. Delighted with the 1936 Ford Cabriolet custom rod built for him by Jim Lowrey and also offered at this sale, Mr. Dingman desired a similar car in a station wagon style. Using the 1936 car as a guide and a barn-find 1939 Deluxe Station Wagon as a starting point, Lowrey’s Auto Restoration did just that. 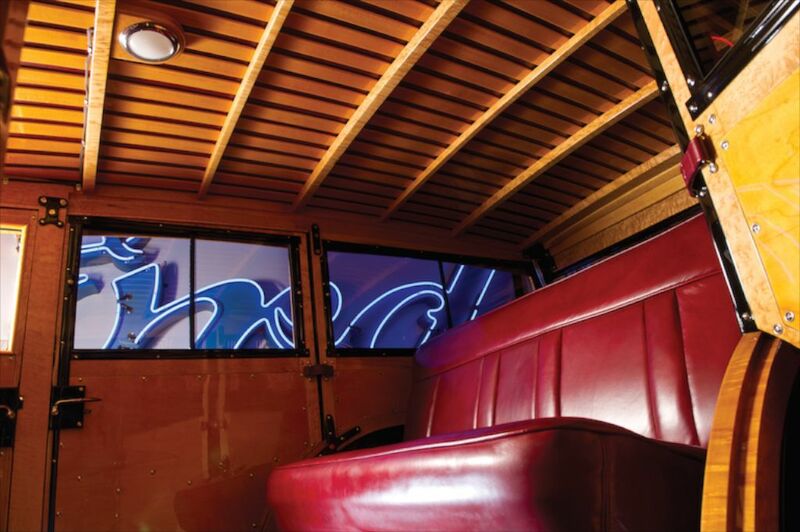 The total cost approached $280,000 and is a testament to the workmanship and superior build quality of Lowrey’s Auto Restoration. 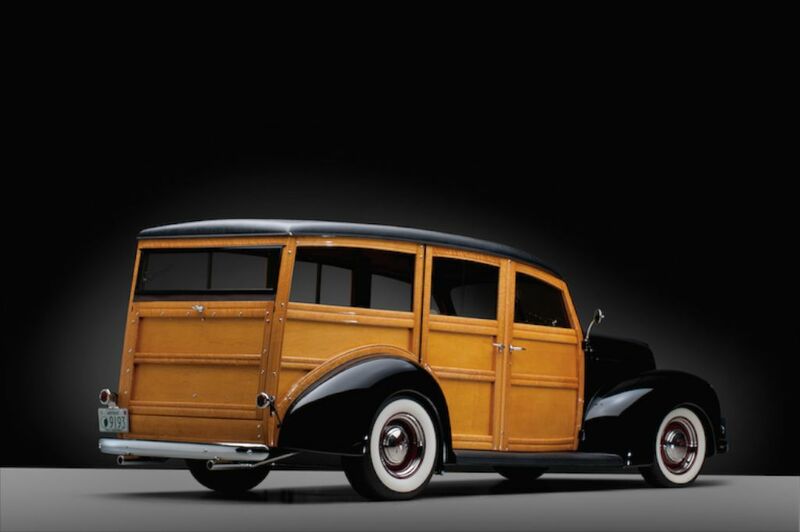 Ford’s 1939 wagons had a number of particularly distinctive features. They were the last to use bodies built by Murray Corporation of America with wood from Ford forests in northern Michigan. The following year, production of complete, redesigned bodies began at Iron Mountain, Michigan, in the Upper Peninsula. The 1940 wagons would move to a forward-hinged rear door and a tailgate spare tire, rather than the rear-hinged and inside spare configuration of the 1939s. The 1939 Fords are very much desired by collectors for their combination of hydraulic brakes, which were new that year, and floor shift transmission, a feature discontinued in 1940. The 1939 Deluxe model also had the purest form of the low, pointed grille carried forward into 1940. 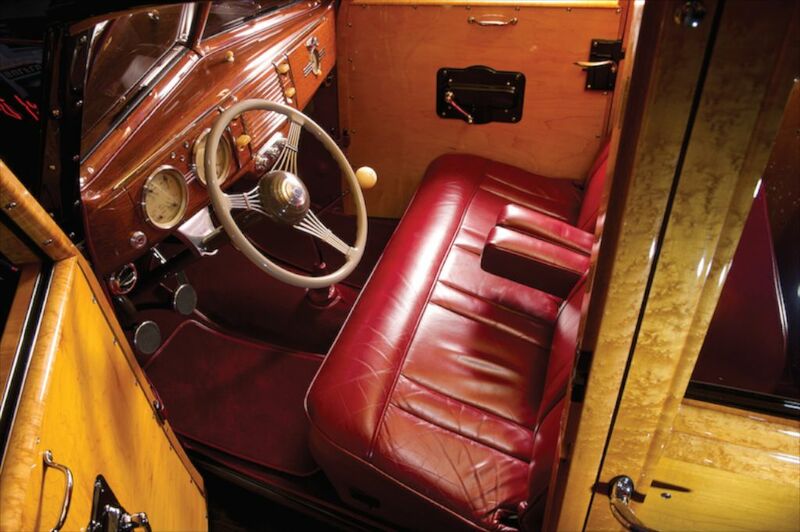 In carrying out the custom rod theme, Lowrey followed the pattern of the 1936 Cabriolet car. The chassis was modified for control arm, coil-over-shock absorber independent front suspension, and trailing arm-coil spring rear design. A Ford nine-inch rear axle was used. 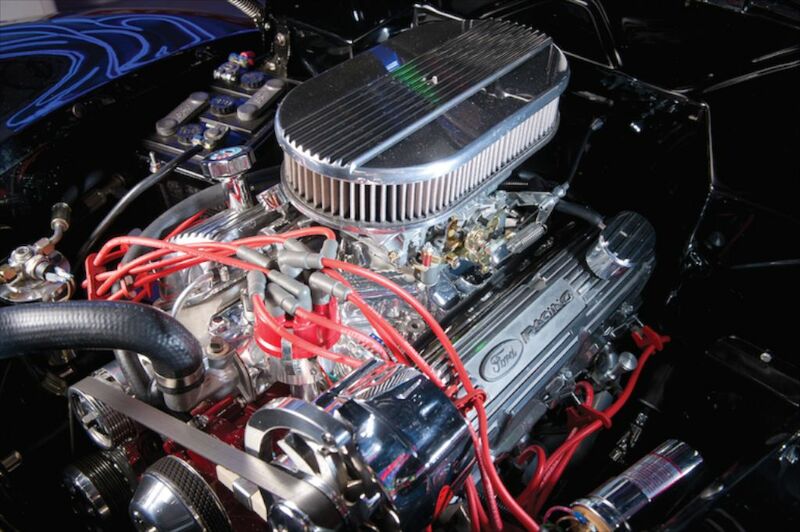 For the engine, a Ford small block crate engine was chosen. A five-speed Tremec transmission was installed with an open driveline. Power rack-and-pinion steering was fitted, along with power-assisted hydraulic brakes, discs in front, and drums at the rear. The car has red disc wheels with stainless trim rings–an understated but very sporting appearance. P185/70-15 radial whitewalls on the front and P235/75-15s on the back, result in a mild rake. The engine is from SPO Ford Motorsports, a 345 bhp version of the venerable 302 cubic inch small block with a Holley 670 four-barrel carburetor and Mallory Unilite electronic ignition, as well as an electric cooling fan. As it emerged from the barn in 2006, the car required restoration of its wood body. 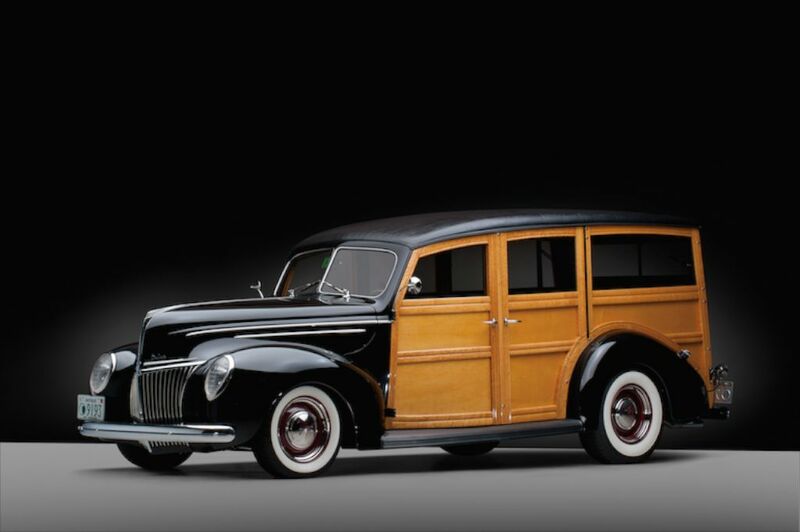 Woodworking specialists Wood N’Carr, of Signal Hill, California, constructed a new body, making liberal use of birdseye maple, a desirable choice that was quite rare on Ford’s woodies in period. The interior of the car was configured for creature comforts. It is equipped with air conditioning and full-width seats in the front and rear. The seats are from Glide Engineering, the front a split bench type with center arm rest. It adjusts manually. The rear seat is fixed in place and both are done in red leather. The third seat was dispensed with, and the rear compartment was carpeted for luggage and other personal effects. Additionally, air conditioning ducts have been subtly installed beneath the dashboard, and the compressor is tucked away, low in the engine compartment. A modern stereo is unobtrusively installed under the dashboard with a hidden antenna. The speakers are located in the front kick panels, and the subwoofers are installed under the rear seat. For this and other electrical upgrades, the car has been converted to 12-volts. The dashboard retains its original form with restored wood grain, and the steering wheel is the authentic restored banjo type. 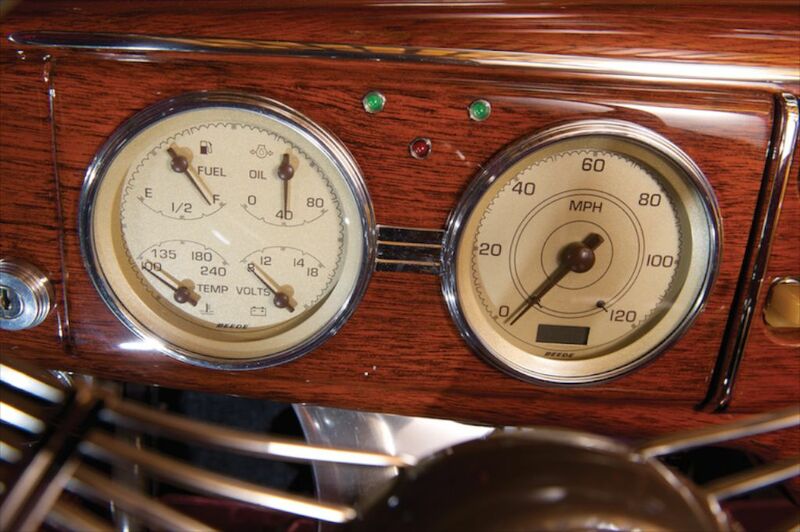 The gauges were sent to Classic Instruments in Michigan for restoration and conversion to electronic operation. As a result, the driver gets the visual sense of a 1939 Ford but with a vastly different feel. Today’s typical street rod or resto rod has a small block Chevy V-8 with a Turbo Hydra-Matic transmission, although Ford purists might use a Ford 302 or 351 and a C6 automatic transmission. As a true Ford enthusiast and historian, Michael Dingman’s cars have been restored or modified to his specific preferences and instructions. The unmodified examples have been restored to their showroom-fresh appearance, while this car in particular captures the customizing spirit that is of course also so prevalent in Ford history and has, in this case, been executed in a very understated and tasteful way. As a result, this car is a true Ford through and through and stays faithful to heritage with a manual transmission. It takes a practiced eye to fully appreciate all the artful updates. This 1939 Ford station wagon custom rod combines the best of authentic Ford features with 21st century technology. The car is fully functional and docile in today’s traffic, while having exceptional performance when more spirited motoring is desired. In all situations it provides utmost comfort and convenience to the driver and passengers. 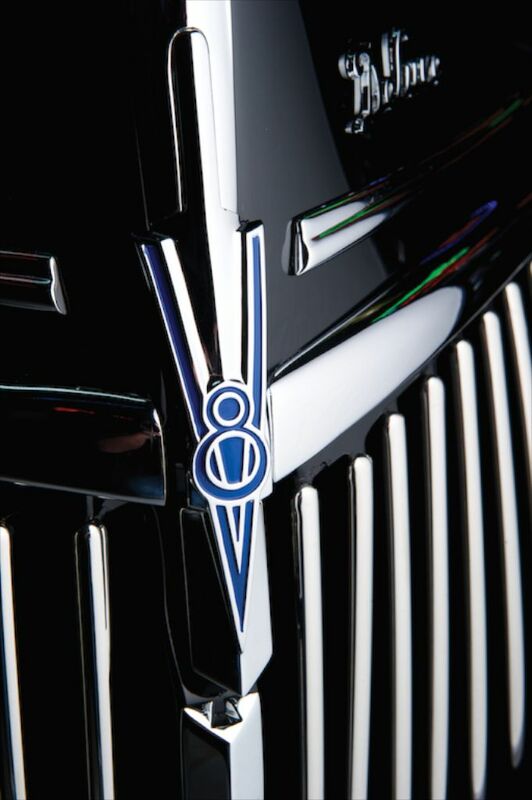 It is, in short, the ultimate 1939 Ford–a blend of classic and modern with styling that stays true to its heritage.